To be honest I have heard a lot of good things about Keratin and the benefits it has for your hair, but I wasn’t familiar with the process and I was nervous I would ruin Carly’s mother’s hair. I read the directions through a few times and also watched a quick training video on YouTube so that I was a little more prepared for the task I was about to take down to china town. Comb, clips, dye brush…I was not prepared!, and gloves. Step 1: Wash the hair 2-3 times with the Keratin Solution Clarifying Shampoo to completely wash all the dirt and oil from the hair and then 100% dry the hair with a blow dryer. As clear as day, Rene’s hair is wild! My hair is easy to maintain and I wanted to really see how well this product works, so she was perfect for this demo. The next step is to section the hair into three or four and evenly distribute the Keratin Solution Brazilian Keratin Treatment all over using the comb and brush. Cover with a shower cap or plastic bag, then the solution has to set for about 45 minutes. After the set time has passed you need to blow dry the hair, then use a flat iron that heats up to 450 degrees. She did complain the solution was strong so make sure you work in an area that is well ventilated. 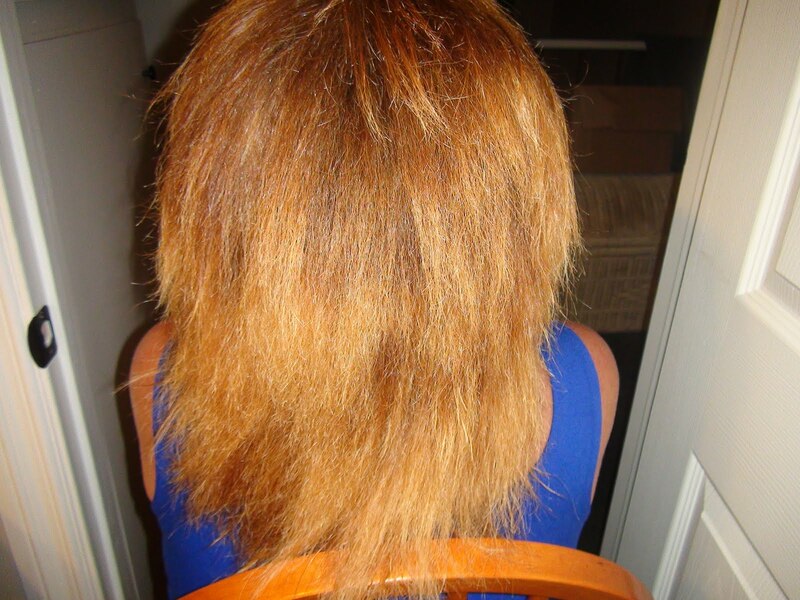 The part that I dreaded the most through out this process was when the time to wash the treatment out of the hair came. All of that blow drying and straightening helped seal the product into the hair. After washing the hair, dry with a blow dryer and use a flat iron once more. While preforming this process, I was really upset when I saw her hair because I did not think the product worked. She would know better than me and she was thrilled with the way her hair dried. Looking back at the first pictures I see the difference and it does look a lot less puffy and frizzy. We are almost done!! Time for the styling! I loved the end result and I knew Rene did also. She couldn’t keep her hands off of her hair! It looked full of life and it even brought out her hair cut! This product and process if for those who have patience. It took me about 3-4 hours to take her hair from uncontrollable to fabulous. She had a different smile on her face and I was happy to be apart of it! All in all the Keratin Solution does work and is worth every penny, nickle and dime! How do you think her hair looks? Have you had a Brazilian Blowout before? would u do it to ur hair sonia?? i had a bad experience with japanese rebonding so i'm super wary now! Wow…the result is pretty amazing but I don't think I will dare to try them. Still prefer to go with the good ole rebonding/relaxing process. Thanks for the post. It's really interesting! Has she washed it yet? I'd love to see how it holds up after a few washes. I am very interested in using this method myself. woah huuge difference Is it a chemical though? Wow, that's amazing. Her hair looks great. Thanks for the review. Where can you buy that product? I am licensed but i know you have to take the class. I am truly interested though in buying it without the class. LOoks great & I love your blog. I hate to correct you, but I think you meant to say, you have to have a lot of patience, not patients!! haha, I do things like that sometimes too 🙂 Also, can you do an update for us after she washes her hair a few times? Thank you! You are very informative and fun to watch and I really love your blog!!! Dang – that product is $200. I thought you had to have a license to have this. Wow! My hairdresser did the mini-blow out and it took just as long. There was a BIG difference from what I was used to. It was nice afterwards to take a shower, wash my hair and only put a light gel in to tame! You couldn't imagine what I had to put in (that only damaged my hair more).